So, attempt #1, a peppermint oatmeal cookie, was a mixed success. 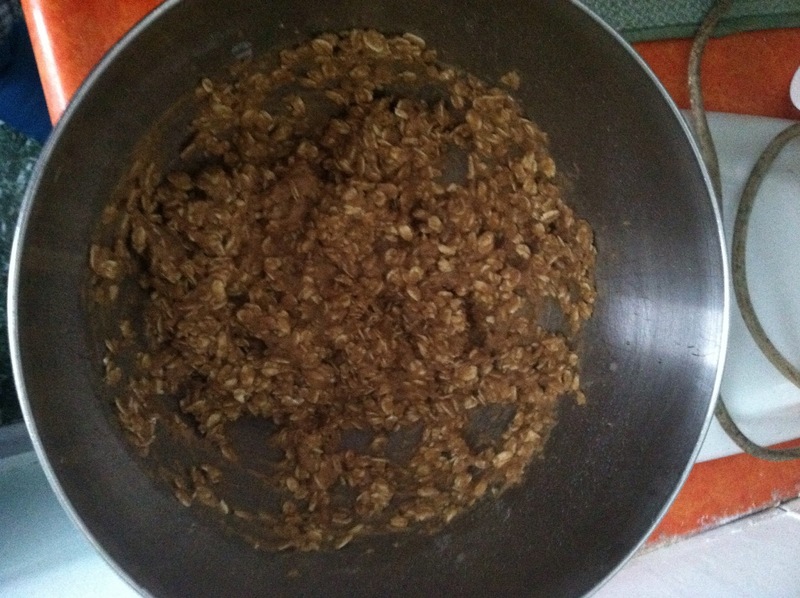 For attempt #2, I went even further into modifying my basic oatmeal cookie recipe. 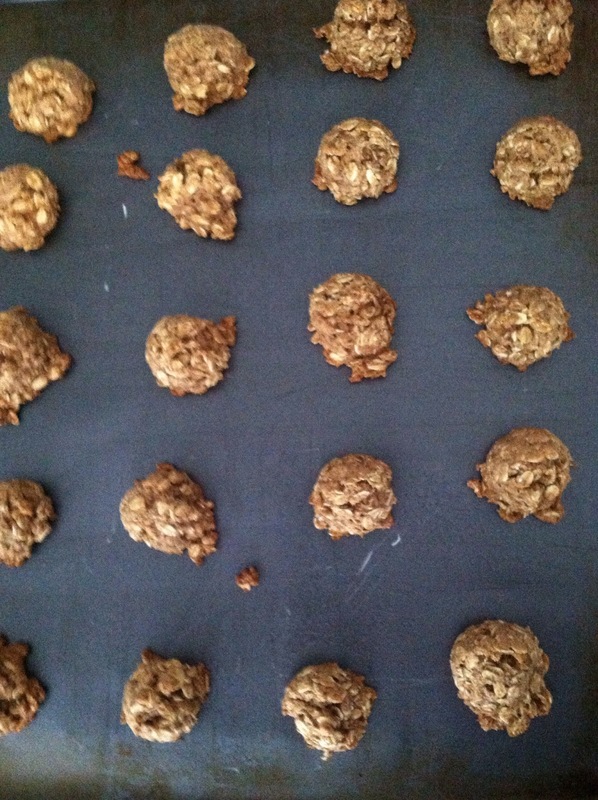 I replaced the butter and the eggs with unsweetened applesauce, I swapped the white sugar for brown, I used whole wheat flour, and I played with the proportions of both the flour and the rolled oats. 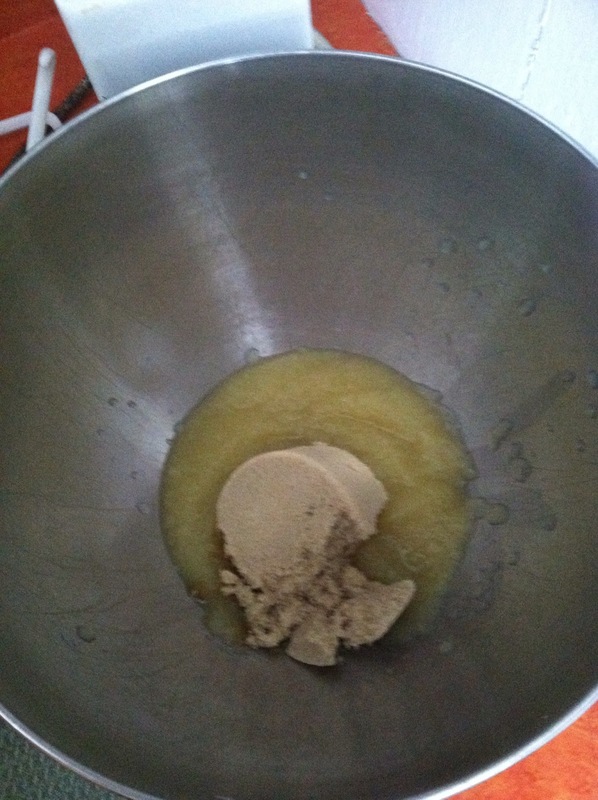 Straight up applesauce and brown sugar to start. Mixed all together; a bit more moist than I wanted, but the flavor was there. Last time, some of the horses weren’t wild about the cookies because they were too chewy. This time, I did a double bake, sort of like biscotti: I pulled them out of the oven, let them cool on a drying rack, and then put them back on the cookie sheet at a low temperature for another 15 minutes. This resulted in a cookie that was definitely not chewy – but it was a bit too crunchy. They were basically inedible for humans they were so hard. However, they were a huge success on the taste test. Several horses completely lost their minds when presented with their cookies, and that included Tristan. He whickered at me from his stall while I was doing taste tests with all the other horses, and scarfed as many as I would give him. Only a few horses weren’t wild about them, and it seemed to be a texture question – they had to move the cookie around in their mouths to get a good bite on it. No one had the reaction they did to the peppermint cookies – everyone ate them and was glad to – but not everyone banged the stall door for more. Getting closer! I think my next step will be to figure out how to keep the good things about this attempt the same – the flavor, simple ingredients, and whole grain components – but lighten them up a bit, so they’re not as dense and hard. I might try upping the baking soda component, or playing with cooking temperature & time. This has been a fun experiment so far! Next Post BEST PONY IN ALL THE LAND. Ooo, love your cookie adventures. I'm having a lot of fun with it! I'm not usually an experimental baker, and this is a neat way to do so in a lower-risk situation. This one was definitely closer than the previous. I have one last variation to try and then I will start to go back over them and perfect the recipes according to my notes.